This blog aims to poke fun at the very nuances of office jobs and everything such a working life encompasses, from goofy interviewing processes to crappy employers to the hideousness of (chronic) low pay. This ain’t no Pollyana story. After years of working in CubicleVille I have had my share of angst and frustration and the tether pole. I truly know that you will relate. However, this blog is also about other jobs out there, blue collar positions included. It’s informative comedy, a vent fest, even inspirational at times. I am a reluctant cubicle dweller that plots my escape every waking moment. I resent CubicleVille and all of its trappings. I type 85 wpm with few mistakes. I usually keep snacks in my desk drawer because I believe the vending machine is part of a grand conspiracy to make and keep workers fat and lethargic and therefore underpaid and confused about their salary history. 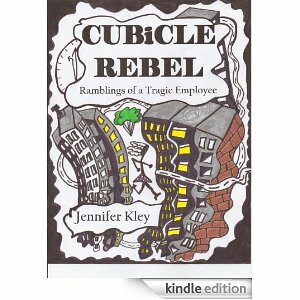 I am the author of the book “Cubicle Rebel: Ramblings of a Tragic Employee”, a memoir of sorts of my hilarious and quite painful jobs from age 11 to mid-adulthood. I am a rebel for only pretending to conform and tragic for my failed efforts. I reside in the Washington, D.C. area, avoid traffic like shootouts, think SUVs are increasingly evil and plan to get a dog soon. I appreciated your comment on my blog. I followed back to your blog and I can relate to so much of it so far! I will follow and already shared on twitter! I am currently sitting in my cubicle….